When we say that something tastes nice, what we are talking about has more to do with smell than with taste. It is estimated that 20% of a tasting experience comes from taste, that is from the tongue, whereas 80% comes from the smell or the aroma. Our tongue has about 9000 taste buds that are capable of detecting sweet, salt, sour and bitter (in order of increasing sensitivity). In comparison, we have around 5-10 million cells or receptors capable of detecting smell. There are about 1000 different smell receptors and they allow us to distinguish more than 10.000 different smells! This is possible because a specific volatile molecule can trigger more than one receptor. It is the combined response from these receptors that we perceive as a certain smell. The Nobel Prize in medicine for 2004 was awarded to Linda Buck and Richard Axel for their “discoveries of odorant receptors and the organization of the olfactory system”. Based on the fact that aroma of foods is so important for the way we perceive them, a hypothesis can be put forward: if the major volatile molecules of to foods are the same, they might taste (and smell) nice when eaten together. The concept was first appreciated by Firmenich scientist Franí§ois Benzi. 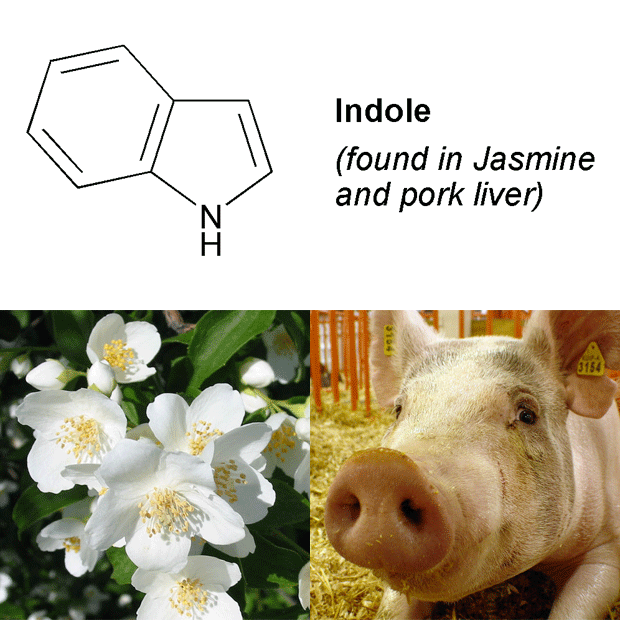 At one the first International workshops on molecular gastronomy in Erice, he got the idea that jasmin and pork liver which both contain indole could possibly work well together. And they did! Photo credits: Jasmine flowers by Kpjas. Pig by The Pug Father. Experimenting with salty ingredients and chocolate, Heston Blumenthal discovered that caviar and white chocolate are a perfect match. 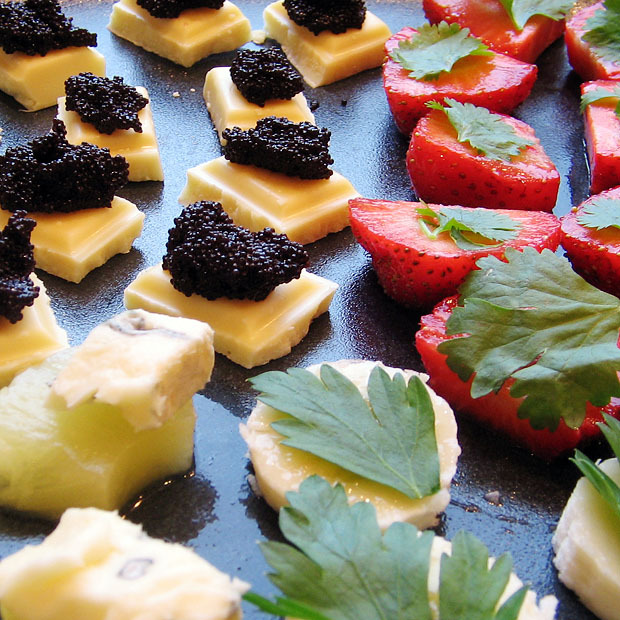 Franí§ois Benzi found that caviar and white chocolate had several amines in common. Since then, Heston Blumenthal has searched a commercial database with information on the contents of more than 7000 volatile molecules in several hundred different foods. Based on this, he has come up with a number of unusual combinations (from egullet.org and other sources). Some of the combinations are also from Herve This. The links are to Heston Blumenthal’s own recipes. Garlic, coffe and chocolate. Garlic and chocolate don’t have much in common, but both have something in common with coffe (original blogpost, cooking challenge: TGRWT #1). To explore flavour pairings like the ones I’ve described on this page, I have initiated a monthly food blogging event, They go really well together (TGRWT), and a summary with links to previous announcements and round-ups has been posted. You also check out my blogposts tagged TGRWT and/or posted in the flavor pairing category. The good scents company – an elegant way to search for volatile compounds shared by two foods is to type the following in a google search box: “pineapple cheese site:http://www.thegoodscentscompany.com”. The website foodpairing.be has beautiful graphs depicting both flavor pairing and flavor substitution – highly recommended! Cut cauliflower in 1 cm slices. Spread them on aluminum foil. Sprinkle with olive oil and salt. Bake in oven at 200 °C for approx. 30 min (turning the slices after 15 min). For the jelly, bring 1 dL of water to the boiling point. Add 1 ts of agar-agar, 1 ts of sugar and 1 TS of cocoa powder. Mix well, pour into a suitably sized container and leave to set. 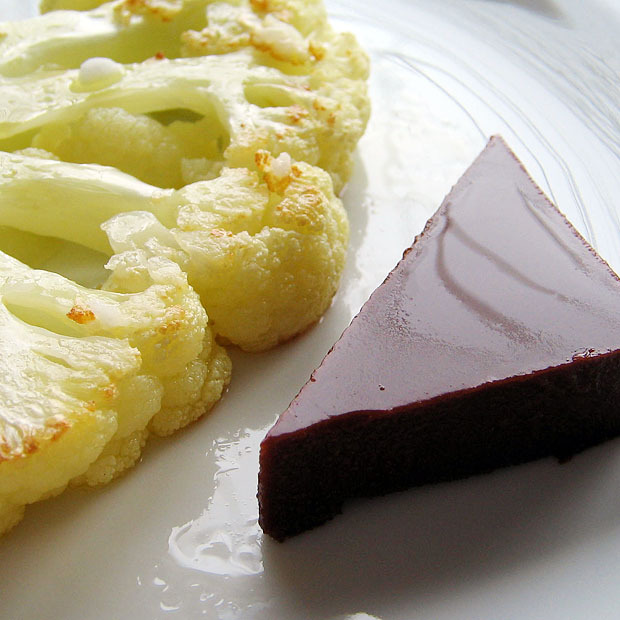 Cut jelly into pieces and serve together with caramelized cauliflower. Other examples I have tasted include white chocolate/caviar, strawberry/coriander leafs, pineapple/blue cheese and banana/parsley (see picture below). They all go surprisingly well together, and I guess the challenge for the cooks is to find a suitable way of presenting these dishes. You can read about other bloggers attempts at this in the many TGRWT posts. It’s something really interesting! The possibilities of composition (combination) are diverse. I use combinations of these “unexpected” to make my flavors. That is, substances present in different types of food but with the ability to leverage this or that sensory attribute, this or that molecule. Really fantastic! Pairing you may not have encountered. Will Sage, lemon and cardamom dance in a lamb roll stuffed with venison? I think this is a very intrestin page and gives lots of Imformation out. Wonderful site – thank you for sharing this. I’m massively into cooking, aromas and also cooking. By being an olive oil taster I discovered the magic world of food pairing and I am coming quite often to consult your blog in order to try unexpected combinations and surprise the newcomers in the world of olive oil excellence. Fresh ideas, possible to elaborate at any time…Excellent blog! Scientific and easy for a food enthusiast to follow. I have made the most delicious honey lavendar ice cream and wanted to make a decadent chocolate brownie tart for dessert to pair. Haven’t tried the two together yet but wondered if anyone had an opinion on chocolate and lavendar together? Love this! …And for those of us who don’t know all the molecules; what a fantastic pointer that actually if two ingredients smell fantastic together, they may well be a perfect taste match too! What are two flavors which taste bad alone but great together? Those are not jasmine flowers next to the piggy. Those are mock orange flowers.